When you want to look pulled together + be extremely comfortable, the boyfriend blouse is the perfect outfit option. The oversized button front top hangs loose + flowy for comfort, and can just as easily be dressed up for Friday date night or dressed down for a Saturday barbecue. Here’s two ways to style a boyfriend blouse outfit, dressed up + dressed down! Let the boyfriend blouse hang loose over a pair of black leggings or skinny black dress pants + add a few key accessories to complete the look. I opted for a gold cuff bracelet and structured blush purse and pointed toe flats. 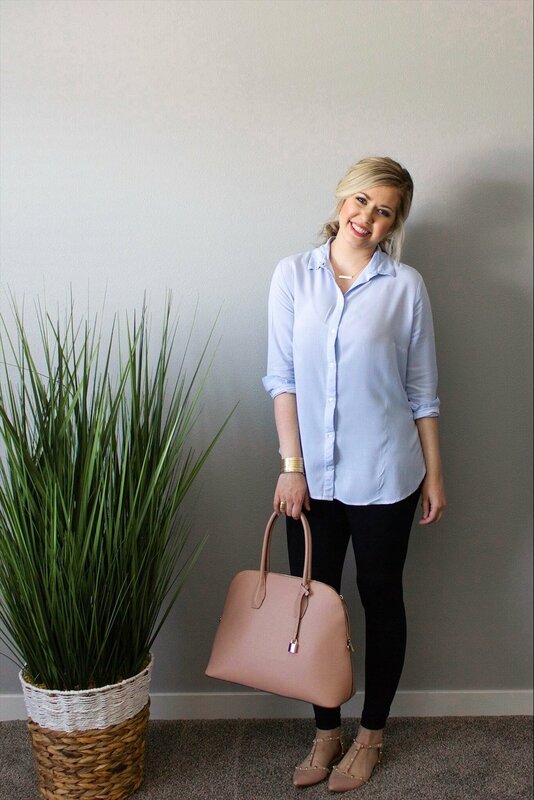 The blush color adds an elegance to the outfit and complements the light blue of the blouse, while the pointed toe flats balance out the casual, unstructured fit of the blouse. Get a little more comfortable + half tuck your blouse into a pair of dark denim skinny jeans. Throw on a matching crossbody purse and strappy sandals, and you’re ready for lunch with the girls. The key to getting the half tuck just right is to make sure you don’t tuck it too tight and stiff. Pull the blouse out a bit and let it effortlessly lay over the waistband.